Whether you want to build a sailing resume or just gain practical experience, getting more miles under your keel is key. You can sail a lifetime of summer afternoons and never quite get the hang of cruising—where creativity and offshore savvy result in self-sufficiency and jury-rigging expertise. Passages don’t have to be long, but they should be overnight and preferably offshore in various kinds of weather. That’s hard to find on charter where you typically sail (or motor) to an anchorage, set the hook every night and head for the bar. Experience also doesn’t need to be all about sailing. The cruising lifestyle is made up of roughly 20 percent sailing and 80 percent everything else, including fixing diesel engines, autopilots, refrigerators, radar and things like broken boom vangs. It’s also about efficient provisioning, navigation and fostering a good attitude because nothing gets smaller faster than a boat with an incompatible crew. So, if weekend sailing and your annual charter vacation aren’t building up much in terms of cruising-appropriate experience (or sea time toward a captain’s license) what does? Try one of the following and see how much you can learn in a matter of just days. Some of these options may be low-cost or even free, so if you’re serious about being a passagemaker, check them out. Much of world cruising takes the shape of rallies, where private sailboats of various kinds gather and travel together under the guidance of an organizer. Because rallies often involve crossing serious distances, owners tend to need additional crew. The Atlantic Rally for Cruisers (ARC) is one example. Boats gathering in Las Palmas in the Canary Islands and in Mindelo in the Cape Verdes often seek help for their passage to St. Lucia. There are 11 different ARC events on both sides of the Atlantic and even one, the WorldARC, that circumnavigates. Crew usually jump on for a leg, and if all goes well may be asked to stay on. Boats from all over the world participate, and language skills can be helpful, although most participants speak some English. Check out the web site Ocean Crew Link (oceancrewlink.com) for more information on berths on the ARC and other crewing opportunities. Note, these may be free or a fee may be assessed by the captain/owner. Participants in larger rallies often plan well in advance, so if you want the pick of good boats and amenable skippers, start searching well before an advertised event. That said, some sailors wander the docks at the point of departure and literally talk their way aboard. Your experience will vary but look for a sound boat and a seasoned captain because a trip to paradise can become your worst nightmare when equipment or personality problems arise. Be sure to list as many pertinent skills as possible, stay positive and flexible and have a goal for each outing as to what you want to learn. Rallies aren’t the only way to find crewing opportunities. Crew networking organizations like Offshore Passage Opportunities (sailopo.com) also offer opportunities. OPO is a free service founded in 1993 that has worked with over 2,000 sailors since. The skipper pays for all onboard expenses, including food, and the crew pays to get to and from the vessel. 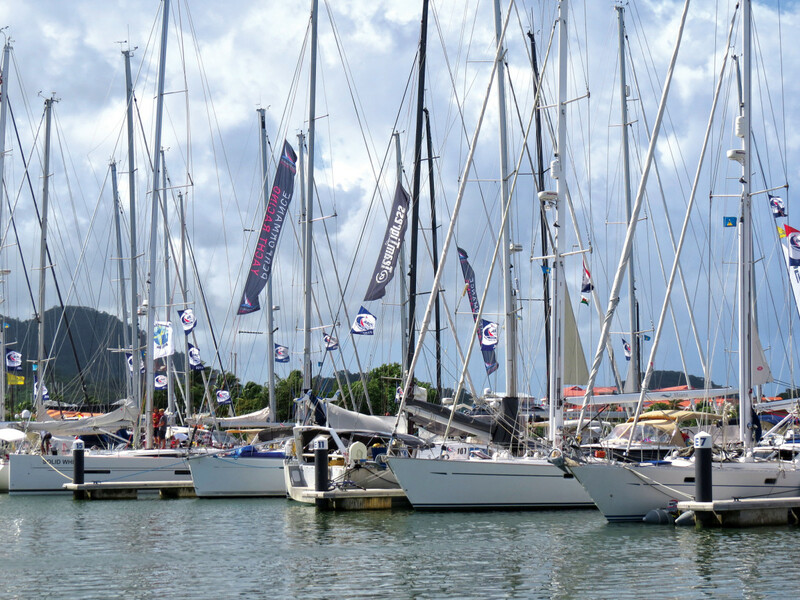 OPO also runs a fee-based program called Swan Passage Opportunities, where you can gain race experience on Swan designs when the boats compete in any of the numerous Caribbean regattas and race weeks. This one is for those who are a bit more experienced but would like more sea time. If you know what you’re doing, you can seek out charter companies that need boats delivered from one base to another. Choose wisely because upwind trips can be brutal slogs, but a nice run from Guadeloupe to Grenada can be a lovely two-week vacation. You will be asked for credentials in order to have a company trust you with their asset, but if accepted, you can probably get away with paying only insurance, fuel and provisioning while you learn what it’s like to reel off the miles. Do keep in mind that anything that goes wrong along the route is your responsibility and the usual charter assistance is not available. There’s really no safety net and nighttime sailing is discouraged. But what better way to get hands-on experience as the captain than on a vessel that’s yours for the duration and self-sufficiency is the name of the game?